We have just published GAYOT’s Annual Restaurant Issue, which includes the highly-anticipated Top 40 Restaurants in the U.S. list. The 2013 edition also names chef Thomas Keller as U.S. Best Restaurateur of the Year. Of the Top 40 Restaurants in the U.S. selected, nine of them did not appear on last year’s list, and three of those, The Mansion Restaurant at Rosewood Mansion on Turtle Creek, Michael Mina and The Willows Inn, are gracing the list for the very first time. Six that made Top 40 lists in earlier years are making a comeback: Bacchanalia, Bouley, CityZen, Corton, Georgian Room and The Restaurant at Meadowood. That means that nine from last year’s list did not make the cut: Cyrus, The Herbfarm, L’Espalier, Masa’s, Michel Richard Citronelle, Patina, Restaurant Eugene, TRU and Twist by Pierre Gagnaire. Thomas Keller is the only chef to have two restaurants with GAYOT.com’s highest rating of 19/20: The French Laundry and Per Se. Yesterday at Bouchon Beverly Hills, I had the pleasure to talk with him about his just-released dessert book, Bouchon Bakery. Sébastien Rouxel, the book’s co-author and the executive pastry chef of The Thomas Keller Restaurant Group, joined the conversation. I had not seen the book until the three of us flipped through the 400 pages. If you haven’t had a chance to see Keller’s first recipe book for sweets either, watch the exclusive video above to discover it the same way they showed it to me. Coming from the masters directly, it is surely the best way to do so. The experience was quite fun, and, of course, a sweet moment to remember! 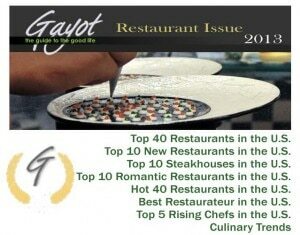 Thomas Keller is the only chef to have two restaurants on GAYOT.com’s list of Top 40 Restaurants in the U.S.: The French Laundry in Napa Valley in the city of Yountville, CA; and Per Se in New York City. Congratulations! Watch my exclusive video with one of America’s top chefs, filmed at the temple of gastronomy that is The French Laundry, and find out how he does it. Last week, Hermès Beverly Hills stayed open late to welcome guests to support The Bocuse d’Or USA Foundation. Not only were we plied with Champagne, but Bouchon Beverly Hills executive chef Rory Herrmann satisfied our appetites with delicious canapés, including gruyère cheese gougères with truffle Mornay sauce; fresh & smoked salmon rillettes on toasted crouton; and my favorite, the “BLT” (house cured bacon, arugula purée and black winter truffle on toasted pain de campagne). Herrmann was cooking in the dark, outside in the parking lot behind the store, yet he nevertheless managed to deliver the quality we expected. Chef Thomas Keller is the president of The Bocuse d’Or USA Foundation. I think the best way to explain what the organization is all about, is to listen to the speech he gave that evening. Lucky for you that we proudly have the only video copy. Enjoy a “bon” beef burger at Bouchon in Beverly Hills. After all, Bouchon is a French bistro, and “bon” is French for “good.” In fact, I’d say it is a “très bon” burger. Though of German origin, the hamburger has now become an American food staple that chef Thomas Keller had to add to his menu next to the steak frites, le croque-Madame and les moules au safran.